Battling Boy shouldn’t be written off as devoid of ideas, either. Pope has no shortage of those, and readers can find them in his renderings of space and movement. Comics are a visual medium; Pope’s innovations are visual in nature. Even the argument that Pope’s style is his substance doesn’t quite do him justice. His lines are too functional, carry too much of the narrative burden, to be celebrated-slash-dismissed as stylistic flourishes. And yet Pope is such a superlative artist that his comics will always disappoint to some degree as long as the quality of his plotting fails to match the quality of his cartooning. In this way, there’s something sad about Battling Boy. 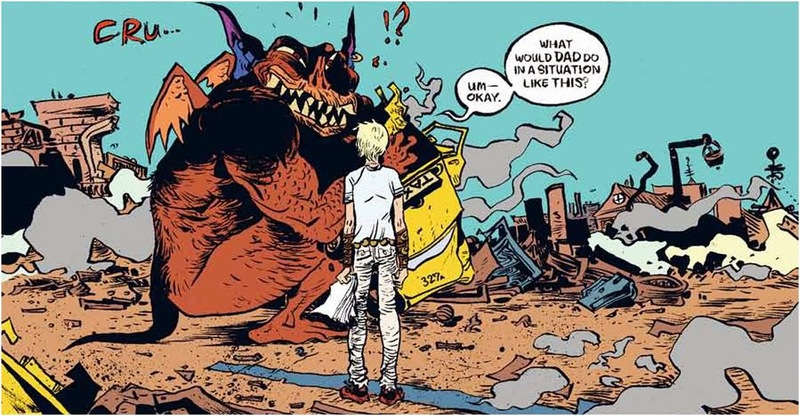 Paul Pope delivered a work that is, in some respects, pretty great. Just not holistically great. And holistic greatness might still be what the greedy reader expects, based on what Pope’s able to provide.